Anyway, take the tomato that you want to save seeds from and slice in in half. Leave until mold just starts to form, then rinse the seeds with warm water, Lay out and pat dry with paper towel. Leave to dry. Store in labeled, little ziplock bags (I've only been able to find them at Michael's but, I'm sure they are elsewhere). 1) Buy yourself a grow light, don't buy the conical shaped bulbs, my experience has shown me that they don't last long at all. 4) Place 1-3 seed in a whole that is about an inch deep and cover with soil. 5) place in a tray and leave inside, keep the soil moist but not saturated with water. 6) Check daily and as soon as you see round leaves (cotyledons) turn your grow light on. 1) Once the first set of true leaves are up, leave for a few more days (don't forget to water). 2) Pot the seedlings up to a larger pot of the same soil mix but, add a handful or two of Kelp Meal to the mix now. 3) Continue to grow in pots, indoors until after the last frost. Fertilize with liquid seaweed fertilizer. 4) Once the roots fill their containers, pot the tomato plants up again by pinching off the cotyledons. 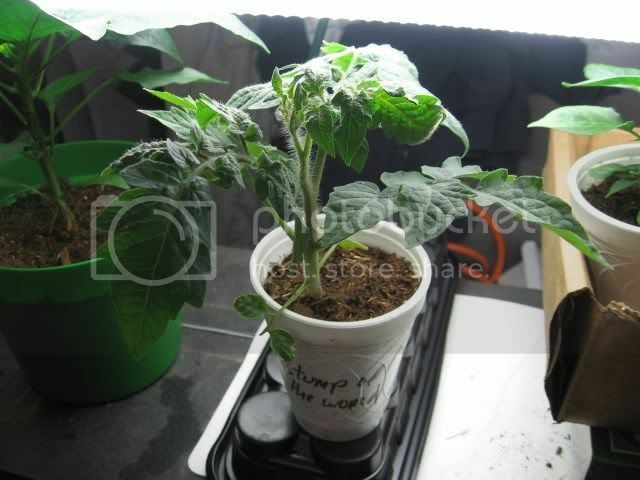 5) When potting your tomato plants also, pinch all the leaves off and bury the entire stem until only the top two leave are above the soil. I know it seems drastic but, it really works. You'll provide your plant with a healthy root system. If you wish to grow tomatoes in pots, use larger pots and one cedar stake. Use old Nylons to tie your tomato plants to the stakes. Don't forget to throw a handful of Kelp meal in the hole before adding your tomato plants. Take about a cup of nice humus compost (not the stuff that smells bad) and place in a five gallon (or 8 gallon) bucket and fill with water. Buy a little aquarium pump and place in the bucket and let run outside for about 5 days. Voila! Compost tea. This will help ward off an plant diseases and provide a healthy flora and fauna of Micro Organisms on your plant foliage. DON'T USE ANY ANYTHING THAT HAS THE SUFFIX -CIDE. 1) Dig a hole that is twice and deep and twice as wide as the root ball. Sprinkle some manure (I use horse, chicken and mushroom but, whatever suits your fancy) around the hole, add a handful of kelp meal and once hole is half full bury the defoliated stem (see above) until only the top two leaves are above the soil. 2) Don't forget to water! 3) Bury a 6-8 foot cedar stake next to your plant and use old nylons to tie to the stake. Don't use string or gardeners tape. 4) Fertilize once a week with either diluted liquid seaweed fertilizer and diluted liquid fish fertilizer. Compost tea (as above is also recommended). Sucker the plants by pinching off any leaves that arise between the apex of the main vine and any branches. This will force the plants to produce fruit as apposed to more vines. Don't pluck off the green fruit, thinking that this will help in ripening or anything else. All your doing is throwing away tomatoes. Thank you!!! Can you explain pinching the suckers off a little more? I'm not sure I followed. Oh, and can you recommend good seaweed and fish fertilizer brands? Also, a side note: some people think that you should remove the first fruit that appear on your plants.... FALSE. All that you are doing there in losing your first fruit. Anyway, your next question was regarding specific brands of organice fertilzer, I won't reccomend any specific brand, but, I will say that it is best to buy these products from local nurseries or organic farms. Kelp meal is great stuff, it's a slow release fertilzer that supplies your plants with both macro and micronutrients. 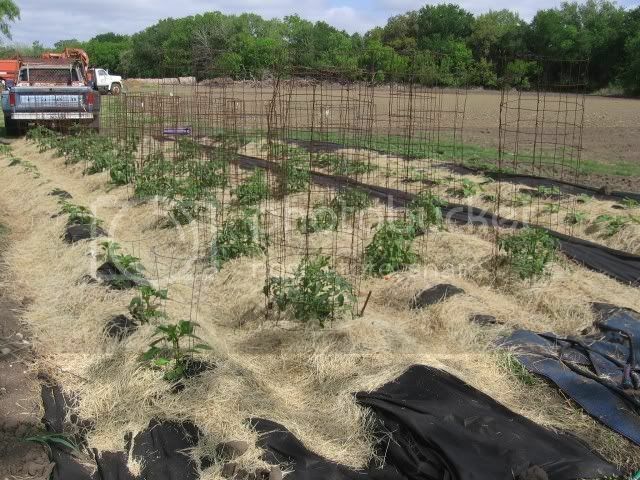 Great idea to tie tomatoes to stakes using old pantyhose. Time to go dig out the pairs with runs in the toes that I just tossed out. Thanks Lorax, got the tip from the propreitor of our old organic nursery. She has a plethora of knowledge regarding growing tomatoes and other plants organically. One additional source of small ziplock-type bags is beading stores. I'm sure Michael's has the small ones, but I can't really go into a Michael's for very long to look for anything due to the perfumes/scents/etc. all over the place. So beading stores (and perhaps other independent locations) would have the small ziplock-type bags suitable for storing seeds. Opa, is there any problem with these bags being airtight? The seeds won't spoil? 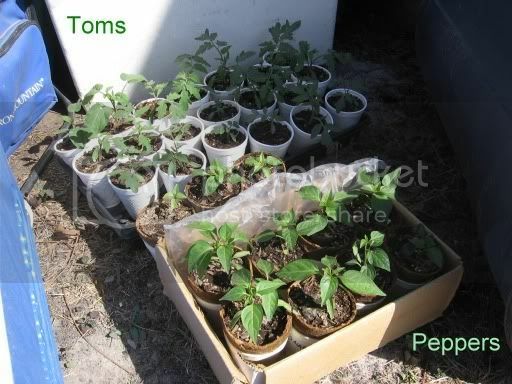 Use seedling mix or a fine textured potting mix, if it does not have added fertilizer water once with Miracle Grow Tomato fert or similar (whatever stuff you give your house plants) at 1/4 strength after the first leaves expand or a few days after you pot up (about the same stage of growth). Seedling leaf nutrients are getting used up at this point. Many Organic fertilizers are slow release because the nutrients first need to be broken down into mineral form. Peat pucks are OK for starting seeds but have no fertilizer. Peat pots are problematic in that they dry out dangeropusly fast, and many people peal them off when putting the plant in the garden. I like to use cheap 4" nursery pots (ten cents each), or plastic drinking cups with holes poked/melted in them. There are many ways to start seeds, from dense planting of 20-30 seeds per 2" pot/cell to single/double seed planting in larger pots. Seedlings are tough and withstand bare root separation/repotting. Repotting once is good for the seedling root structure, more than that sets the plant back, and it can be argued that setting the plants out in the garden counts as one repotting (as opposed to planting seeds in the garden). If you are going to seed into a large pot I suggest only half filling the pot for seeding, and then add soil as the plant grows to stimulate root growth from the burried stem. Buy a cheap standard 48" fluorescent shop light and a couple of brand new 6000K daylight tubes and place 4"-6" above the seedlings. I set the fixture on boxes at both ends so I use it about anywhere (I also have 250 watt, 400watt and various other "professional" grow lights, but this is the cheapest/easiest for most people). Tip: Find some white stuff (card board, large plastic sweater box lids, sheets, towels, garbage bags etc) to box in your light set up and reflect light back onto your plants to increase growth. Fluorescent lights are only a small fraction of the strength of the sunlight the plants need. Lots of organic matter in the soil, and 10:10:10 granular garden fertilizer is cheap and works well. The organic matter, and the soil microbes living on it bind up the fertilizer minerals making them slow release, so you can add fertilizer to your compost pile too, especially good if you have a lot of brown matter. I apply fert to the whole garden when I dig it up in the spring, and don't bother with amending planting holes. Too many plants to get in the ground, too little time, too hard on the back. Optional: After first fruit set/mid season (when the plants are really growing) side dress with more fertilizer - (sprinkle a couple of tablespoons around /between each plant), or water with the miracle grow. The plants have begun to use up the fertilizer under them at this point. Use your noggin, If your plants are 6-7 ft tall mid season they probably don't need more food. If cutworms are a problem in your area loosely collar the seedlings with cardbard (toilet paper rolls, cut paper plates), plastic (cut water bottles), or aluminum (cut pie/turkey baking pans) with a couple of inches below the soil and a couple of inches above so the worms don't crawl over. A small stick/nail/soda straw next to the stem prevents the worm wrapping around the stem and feeding, so some people do this instead. After planting out spray with insecticidal soap or permethrin based insectide (or something nastier) as soon as you see the beginning of flea beetle damage to young plants. Flea beetles don't usually bother plants after they have been in the ground for a couple of weeks, but they can tear up a baby plant in a couple of days. At first sign of fungal leaf problems clip off affected leaves and spray plant with daconil or mancozeb. Some people spray weekly, but I find that weather affects the problem. Dry- warm weather = lessened problem= no spray. Some plants are worse than others. I only spray plants that need it. The deeper you dig the soil, and more organic matter you add, the less you need to water the plants. It's just about tomato season again in middle Arizona. Trees are budding out and my lawn is already green. I got a little over anxious and already put three plants out into the yard. After the 3rd day they got frosted and I was sad. I'm going to get some going under the patio where they should be protected from anymore cold snaps. QUESTION: Do any of you add red worms to your soil? Concerning tying tomatoes to steaks: I use plant fibers to make twine. dead grass or reed strands work well when wet. I don't know if it gets any more organic than that. I started my seeds in late February..some in peat pellets, some in MG potting mix, and some in Canadian sphagnum peat moss. Some say that the peat moss is too acidic to grow seedlings in..I must have lucked out. I covered everything with saran wrap and put them in a warm spot on top of my fridge..a couple of days later they started to pop up...so moved them into the living room on a 4 tier shelf set up with 4 shop lights with t8 6500k spectrum lights and put them within 2 inches of the light....there they sat until the first true leaves appeared. They then got a pot up to a larger 16oz cup and an oscillating fan was put on them to simulate a light breeze to strengthen the stems...a few weeks later they were ready to begin their life outdoors, so I put them outside in the shade with filtered sunshine..They were fed diluted doses of superthrive hormone mix and liquid seaweed. The plants are now hardened off and ready for their permanent home. 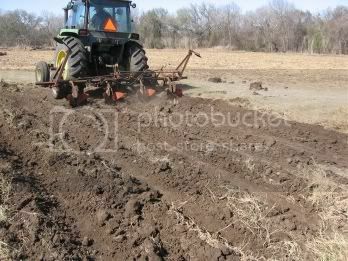 I have the garden plot roughly 50' x 75' to prepare....I take my TX tiller (John Deere 4430...my icon) and disc the soil left \ right / and straight |.. I run a soil test to find out that I have plenty of NPK and that the ph is at 6.8....ideal Ph for tomatoes is between 6.5 and 7.0. Anything above or below that and some nutrients may become locked up and may not be available for the plants. I run a sprinkler over the plot to even out the nutrients a week before planting...garden is ready. The plants go in..taking off all of the lower leaves and burying the plants up to the first set of leaves. Some Bio Tone fertilizer is placed directly into the planting hole..enriched with mycorrhizae bacteria..this bacteria develops a symbiosis with the roots giving them more of an availability to the nutrients in the soil.. This deep planting method ensures that the plants will have a strong root system....all those little hairs on the stems will sprout new roots when buried. Some may choose to trench plant the plants which is when you dig a trench and lay the plant on it's side and bury the stem. The plant will right itself and start growing in a straight up manner. Advantages are that you can plant an overly tall plant..disadvantages are that the roots are not as deep in the ground and will suffer when droughts occur because the moisture is deeper in the soil. This is where mulching comes into play. 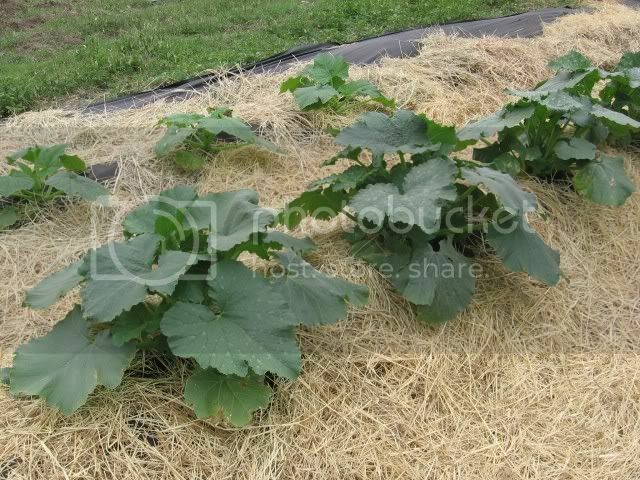 It's very important to mulch your garden..at least 3-4 inches thick.you can use straw, leaves, grass clippings...anything that doesn't have any weed seeds..the mulching regulates the moisture and cuts down on weeds. I put out weed stop fabric and put my mulch down on top of it..works well. 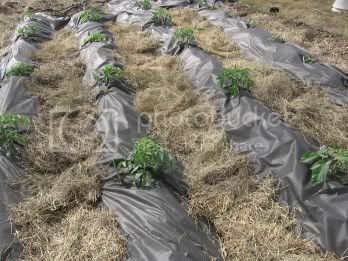 I run seeper hoses underneath the weed stop next to the plants and cover them up with the straw mulch.. Some choose to prune off the suckers of the growing plants..this isn't needed if you grow in cages,,I just let them bush out. feeding them weekly with liquid compost and feeding the soil with liquid molasses to support the bacteria. My garden isn't anything as elaborate and awesome as Atacosas', but I might have a couple tips. The first "tip" I have is that my tomato plants, so far, are doing much better than last year. Last year everything had a disease of some sort by the end of May. This year everything is abundant. Last year I didn't fertilize at all. This year I have fertilized regularly every couple of weeks with a standard store bought tomato fertilizer, some Tums crumbled into the dirt, and a little urine (seriously) added in. My tomato plants look better than they have in 10 years of amateurishly attempting to grow Tom's here. Urine and Tums? Are the tums for calcium? What does the urine do? (For those who use it) It's a source of nitrogen. There have actually been discussions on this topic , so a Search of the forum will lead you to them. Last edited by cynthia_h on Mon May 10, 2010 2:39 am, edited 1 time in total. My seeds aren't coming up. It's been two weeks. I think I may have planted them too deep or something. Should I start over?